VIDEO: Did You See Bernie Marcus Trash The Democrats On Tax Reform Friday? This was on Neil Cavuto’s show on Fox News Friday afternoon and it’s seven minutes of highly entertaining TV. 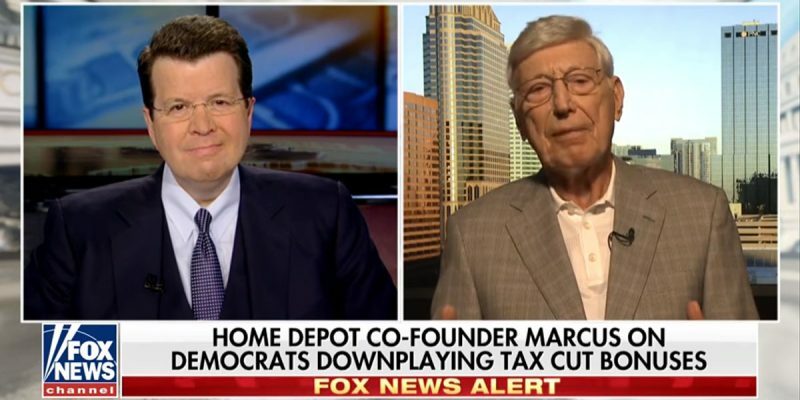 Bernie Marcus, one of the three founders of Home Depot, is a big proponent of the tax reform bill passed in Congress in December, and he’s an even bigger critic of the Democrat opponents of the tax cut passed as part of the bill. Put that together with Cavuto’s interview style, which largely consists of winding his guest up and letting him say his piece with only limited interruption, and you have one of the better experience-based economic rants you’ll ever see. From a business owner’s standpoint the two main points Marcus makes about the tax reform bill are worth repeating. First, when you drop the corporate income tax rate down from 35 percent to 21 percent, that’s a very big deal. Consider a small business which turns a before-tax profit of, say, $200,000 per year. That rate change represents $28,000 in operating capital that company now has available – which could be enough to bring on a new entry-level employee, it could be enough to upgrade equipment, buy a new company car, move the office into a larger space or any number of other things. And for a bigger company, well – you get all the announcements of bonuses and raises for employees at Wells Fargo and Starbucks and so on. But the other item Marcus mentions is also a big deal, particularly for small businesses. That being the ability to expense new equipment and other capital improvements. Marcus mentions the pizza parlor owner who’s going to remodel his restaurant, and that’s certainly going to happen all over the country as a result of the tax policy change. But for small businesses around the country one of the key disadvantages in competing with bigger companies is keeping up with technological advantages that larger firms have the resources to access earlier in their rollouts; now that a company can expense those purchases rather than having to use after-tax dollars to keep up with the big boys, it’s a game-changer. As Marcus notes, the effects of those changes on small business are going to be far-reaching and they’ll create a groundswell of economic growth as some of the little guys find purchase in the economy and start to become big guys. Don’t be surprised if the economy begins growing at a very fast pace by the end of this year. And what will the critics of the tax reform bill say then? The guess here is Bernie Marcus will be chirping even more loudly at them.